Gain an accelerated introduction to domain-specific languages in R, including coverage of regular expressions. This compact, in-depth book shows you how DSLs are programming languages specialized for a particular purpose, as opposed to general purpose programming languages. Along the way, you'll learn to specify tasks you want to do in a precise way and achieve programming goals within a domain-specific context. Domain-Specific Languages in R includes examples of DSLs including large data sets or matrix multiplication; pattern matching DSLs for application in computer vision; and DSLs for continuous time Markov chains and their applications in data science. 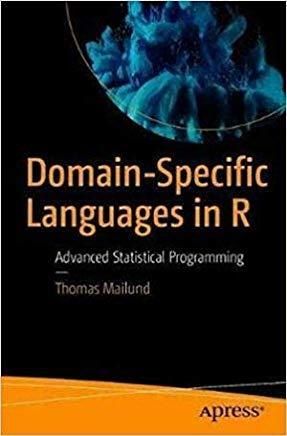 After reading and using this book, you'll understand how to write DSLs in R and have skills you can extrapolate to other programming languages.